The Repertoire of Panache Strings includes the original Franc Zappa, Mozart, Haydn, Bach and Rossini, as well as popular tunes such as the Blue Danube and Pachelbel's Canon. 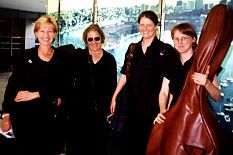 The Panache Strings quartet has more depth and range than the average classical quartet, as it comprises violin, viola, cello and double bass. For special occasions the ensemble can expand to a quintet or larger, or perform as a trio. The Panache trio includes violin/viola, cello and bass. For those searching for an ensemble to make their event special, please talk to us via the details below.